Discussion in 'Modding and Hacking - Consoles and Electronics' started by superg, May 30, 2014. 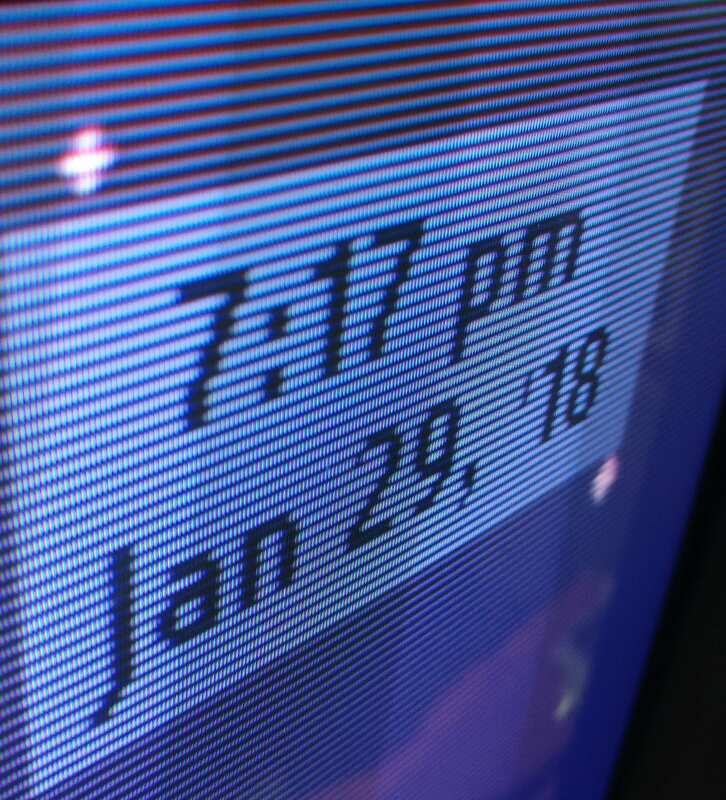 Last few days I was on a quest to find RGB signal from my CDi 450. It uses custom Bt9106KPJ video encoder and google doesn't know much about it :/. Well, I kinda admit it's a crappy console but maybe this information will be useful to somebody. Yeah, I've noticed that Bt encoder is used in 3DO console also. I bought 3DO RGB kit from Otakus yesterday and also I got some schematics, will try to look into this, maybe I will be able to use same approach for CDi. So one thing rather interesting about an alternative Brooktree DVE chip (bt856) is that the datasheet here: http://mjpeg.sourceforge.net/driver-zoran/datasheets/bt856.pdf references the output pins for RGB as available but shared with Y/C/CVBS. Pins 2, 4, 6, 8 are RGB and CVBS respectively when pin 10 is high and CBVS, CBVS, C, Y when pin 10 is low. It is a stab in the dark, but I wonder if pin 10 on the Bt9106KPJ is currently low and if you get the same CBVS signal from pins 2 and 4. The fact you found C and Y on pins 6 and 8 REALLY has me curious as that would also line up with the analog output circuit of the bt856. That's very interesting find, and it would be a very elegant solution to do if pin 10 controls the mode. I may try that later once I'll sort out my other activities. Other than that those BT chips accept RGB bit matrix as the input so the chip can be replaced with Altera which will generate proper RGB (or analog approach which was used in 3DO RGB mod, some French web store is selling that for a premium, forgot the name). I've tried this today and it doesn't switch the mode :/ (by default pin 10 was floating). Other than that the IC really looks like BT856, VAA and GND are on the same spots and so are the RGB matrix pins. RetroRGB has sent me CDi 210 PCB photos. That console has SCART output and BT9107KPJ. I think I'm missing something here. There definitely should be a way to switch to RGB mode. I've tried this today and it doesn't switch the mode :/ (by default pin 10 was floating). So here's the thing: retrorgb has sent me the photos of CDi 210 which RGB capable through SCART output and BT9107 is used. I'll have such console here soon and I'll check everything with oscilloscope. Will report my findings here. Did you ever get the RGB capable console? I've purchased RGB capable CDi 210 off eBay and measured everything. I experimented a lot with it and it seems that Bt9106KPJ just doesn't have any RGB functionality. I tried to replicate exactly the same pin configuration (assuming that it should be configured similarly to Bt856 as explained here) as I see in 210 model but nothing changed. I could easily re-solder Bt9107 to CDi 450 and I'm 99% positive that I will get RGBS capable 450 but I don't feel like destroying my model 210. Thanks for the Info. I'm getting a DVS VE-200 so I'm curious to know what type of encoder it's using inside. I've bought a CD-i 490, which has the 9107 chip in it. I have tested lifting and pulling pin 10 high, this definitely disabled Y/C output, but I was unable to get R/G/B/CVBS output working - Unable to find CVBS on pin 8 and wasnt getting expected voltages on the R/G/B 2/4/6 pin's either. The R/G/B pins on the SCART socket solder points were all GND when pin 10 is high. YCMODE pin is low without me touching it. The BT910x chips are an obscurity, I have looked all over the Internet for the data sheets with no luck. I have been talking to superg recently on this as I have been trying to get RGB working on BT9103 encoders in the 3DO FZ-1 with no luck. Lifting pin 10 high resulted in no changed. Myself and superg believe that the RGB function just doesn't exist in the BT9103/6 chips. What voltages were u getting on pins 2,4,6 and 8 with pin 10 pulled high? RetroRBG wrote on his site that it was CDi with the Sony encoder which could output RBG. Your mobo may have a 21 pin SCART header but may not have been developed to output RBG, just CVBS over SCART. I hope I'm wrong and the BT9107 can output RBG. Here we can see that the BT9106 and BT9107 share the same pinout and both ARE capable of RGB out. Their pinout is fundamentally different to the BT856 encoder which is why we were unsuccessful. 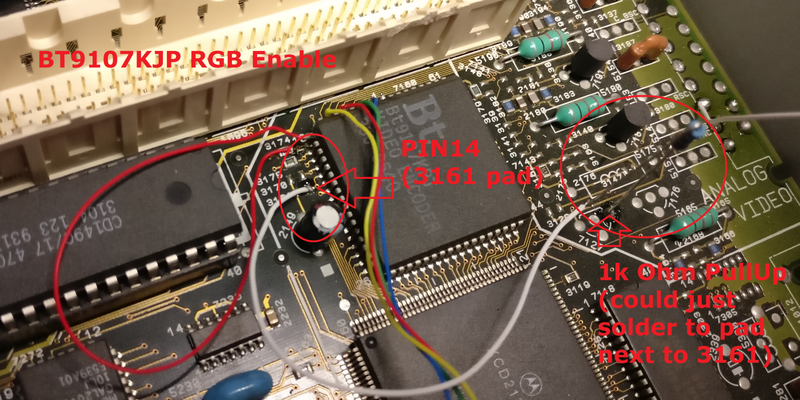 Pin 14 is the RGB select pin. Pin 10 is SCL which must have switched the encoder into some sort of programming mode. So all the encoder needs is a single pin lifted and tied high to enable RGB. Thanks to @bbuchholtz at AtariAge for kindly sharing the service manual. Tajigamer2 & @bbuchholtz from Atariage forum thanks so much - I will try this asap. 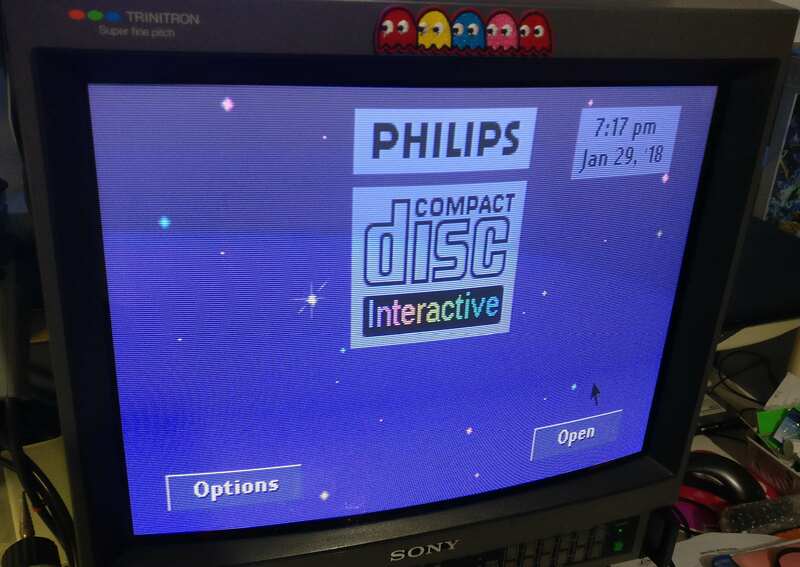 Needless to say I am quite excited - I have had many problems with my RGB modded CD-i 220 which is apparently a hairline crack in the PCB somewhere, which results in constant CD reading issues. It appears pulling pin 14 high with a 1K Ohm resistor *should* do the trick. Well - good news everyone! It works. When Pin14 is high, S-Video output stops working. It appears there is no C-Sync, only CVBS available. Even without any amping of the R G B and CVBS signals, I was able to get a stable picture on my PVM. This is a US-NTSC CD-i 490 console. The coloured cables soldered to the IC are not accurate - those are the colours which I thought were correct with the previous information we had. As shown in the PDF document, pin2 is CVBS, pin 4 is RED, pin 6 is BLUE, pin 8 is GREEN. The image is not stable without amplification or the correct circuit after the IC - sometimes when I power up the console I get a picture, then it fades away vertically, not sure how it was working when I got these pics, but the proof is in the pudding -- RGB does work. CkRtech, bbuchholtz, Bearking and 1 other person like this. This is very good news, thank you for sharing the docs! Sorry, have been very busy lately. Awesome. I saw this thread get bumped on assembler and thought perhaps progress had been made since that 856/7 pinout I posted. Big thanks from me also to you, @Taijigamer2, and @bbuchholtz. Who knew the service manual for the CDi 220 would be so thorough and helpful? And how awesome that it is so amazingly simple! I'm glad we managed to work it out. The BT856 that u posted was really useful. It helped me work out the BT9103 encoder in the 3DO which does share the pinout very closely. From this I could design a RGB mod which was compatible with all 3DO (except Anvil chip). Now I just need to find the service manual for the 3DO to see if the BT9103 has a magic RGB pin. bulletbob and CkRtech like this.